« TND – August 5th . . . . Did You Know Canned Creamed Corn is Vegan? I craved the dense salty taste of a good Virginia Ham. However, I knew trying to find that was a lost cause in the middle of August. At Christmas and Easter I can get enormous spiral cut hams, which are still not the same thing but at least fake it, but in the middle of August I settled for boneless smoked ham roasts which I scored in a diamond pattern, and then reheated/steamed in a bourbon bath and glazed with peach jam. I got a nice crust from the peach glaze, and thick slices of ham to put on my biscuits. Not the same as a Virginia Ham, but faster and cheaper, and most importantly, available at my local grocery store. Does everyone hate peeling eggs as much as I do? I always find that there are about half the eggs that just do not want to peel, and you end up losing half the egg white because you can’t get the shell off of it. Is there some super secret restaurant trick to getting eggs to peel beautifully? And if so, can someone break the secret of the confessional and let me in on it? In my (fruitless) search for an easier way to peel an egg I came across the suggestion that after you cook the eggs you roll them to crack the shell and leave them in the water bath to cool. The theory is that the water seeps under the shell and separates the shell from the egg and the shell will then slide off easily. Verdict is . . . kind of. The eggs that deigned to allow themselves to peel were easier to peel, but this process did nothing for the eggs that were hanging on to their shells like grim death. 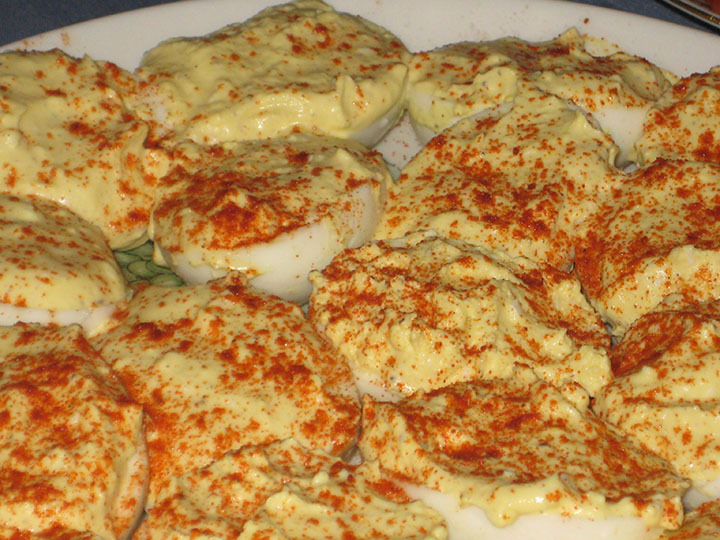 Recipe previously given: The Curse of the Devilled Egg is Lifted! Preheat oven to 350. Rinse and trim the beets and then place in a single layer in a foil packet and roast for 45-75 minutes, or until a knife easily slides through the center of a beet (how long it takes the beets to cook will depend on their size). 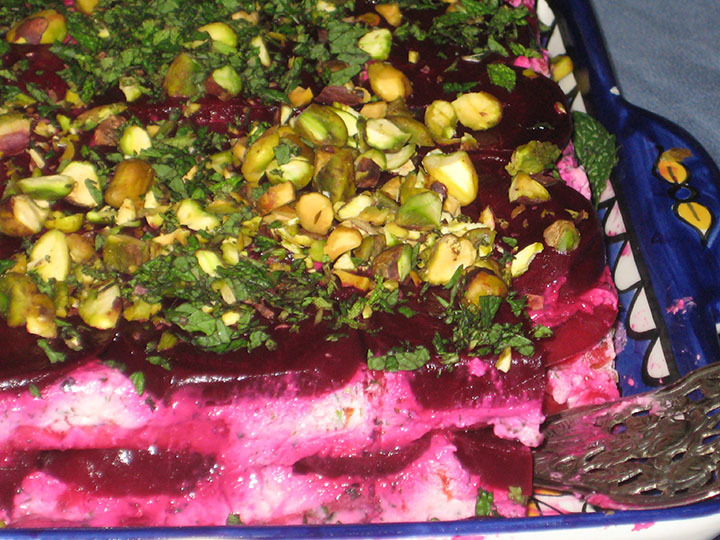 This can be done several days in advance, just stash the roasted beets in the fridge until you’re ready to use them. 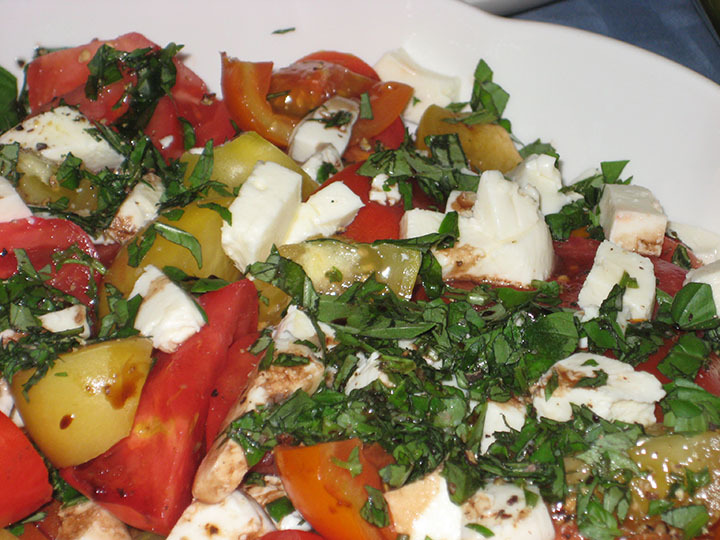 Place the ricotta in a paper towel lined strainer and drain overnight in the fridge. In a blender, or using an immersion blender, combine the ricotta, cottage cheese and a splash of milk. Puree until very smooth. Fold in the lemon zest, parsley, mint, minced dried peaches, honey, and salt and pepper. Adjust seasoning to taste. When the beets are cool rub off the skins using a paper towel (resign yourself to the fact that your hands will get stained). Slice off the top and bottom of the beets and then slice each about ¼” thick. Slice the nectarines into ¼” thick slices. Cover the top with another piece of cling film. Place a plate (or two small loaf pans) on the top of the covered terrine and weight them down with something (I used jars of pickles and cans of beans). Refrigerate overnight. Turn the terrine out onto a platter and carefully slice into rectangles (I actually cut mine in the pan and then turned it out). Garnish with some chopped pistachios.